A Ferrari one-two at the Dutch Grand Prix was headed by Rene Arnoux who became a contender for the championship despite pledging to help team-mate Patrick Tambay earlier in the month. Nelson Piquet led from the start in his Brabham with Eddie Cheever's Renault second at the Tarzan Hairpin from 11th on the grid. Championship leader Alain Prost soon moved through traffic to take second and concentrated his attack on Piquet, making his move at mid-distance just before the flurry of pit stops. Tambay's day started horribly as he almost stalled at the start and dropped to the back of the field. 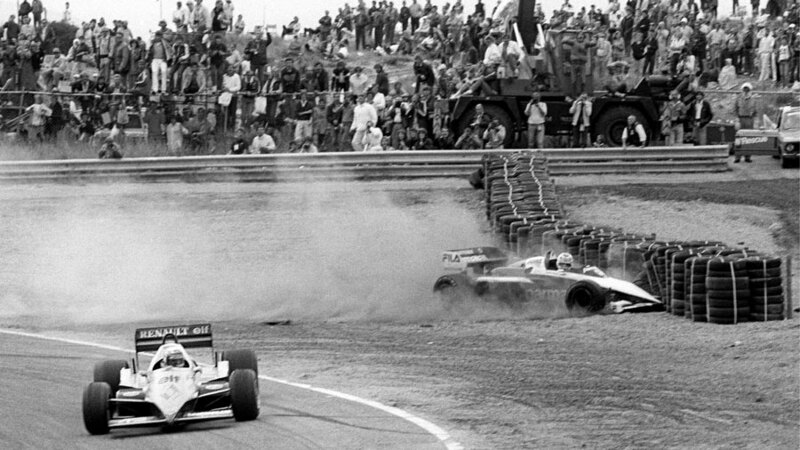 Prost attacked at the end of the pit straight and was given racing room by Piquet. Prost, though, braked too late and lost control, bouncing off the side of the Brabham and into the gravel. Piquet stopped immediately; Prost tried to drive on but half a lap later his damaged front wing folded under and he spun off. "It was my fault entirely," Prost admitted. "I made a mistake." Piquet added: "We were both fighting hard for both the race and the championship and it was just one of those things. I know Alain wouldn't do that on purpose." Arnoux took over the lead - after qualifying a disappointing tenth - with Tambay chasing him home. Behind them, John Watson took third after an aggressive drive in the last race before McLaren's new turbo engine was ready. Derek Warwick dragged the Toleman up to fourth, the first championship points for both him and his team. Cheever dropped down the field as the race progressed and broke an ATS mechanic's foot when he ran it over during a pit stop. It was not ATS' day. Manfred Winklehock was disqualified after starting from his qualifying position rather than the back of the field after leaving the pits late. He was in the top ten when he was black flagged. With three rounds remaining Prost led the title race by eight points from former Renault team-mate Arnoux, with Piquet and Tambay joint third a further six points back.